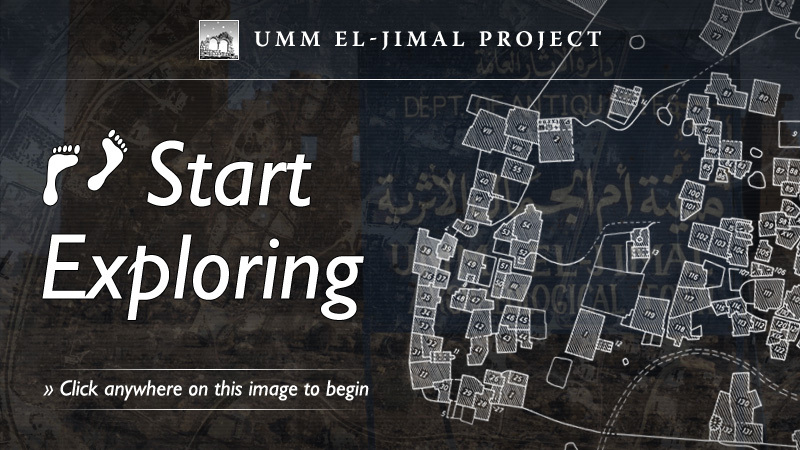 The Umm el-Jimal Project and Open Hand Studios are proud to announce completion of an innovative online tour to complement Umm el-Jimal’s walking path, narrated by project director Bert de Vries. This virtual site walk combines multimedia content and 360° virtual reality photography to link over 30 major points of interest inside the ancient ruins. The tour covers a wide swath of Umm el-Jimal's ancient and modern history, with insights into its unique architecture, environment, and the people who made it thrive. These points also match site signage currently under creation by the project in conjunction with Siyaha, a USAID-funded Jordanian tourism development program. For all users, clicking anywhere on the main image above will enter the virtual tour. Once in the tour, use the navigation bar buttons along the bottom of the screen to explore the image 360° in any direction. Or, click and drag to move around, and if available use the mouse's scroll wheel or trackball to zoom in and out. On touch-screen devices, swipe to navigate and pinch/spread to zoom. Several scenes contain additional embedded multimedia content which can be clicked to view, play, or link. While overall performance depends in part on the speed of a user's Internet connection, the technologies and images underlying the virtual site walk have been optimized for a wide variety of hardware: In most cases the tour will adapt directly to your device. There are multiple ways to move through the site walk. First, small hotspots, or links, are located inside each 360° image; hovering over a hotspot will bring up information about the previous or next scene in the tour, while clicking it will jump to the point itself. Second, clicking the Image button in the tour's navigation bar will show/hide a scrollbar of clickable thumbnails for all points of the tour. Third, the navigation bar's Map button will show or hide an interactive map linking to each point over its actual geographic location. The virtual tour is compatible with recent versions of all popular, standards–based browsers including but not limited to Chrome, Firefox, Opera, and Safari. However, Internet Explorer users must upgrade to Version 10, as only this latest version of IE has full support for HTML5 and other web standards. Aside from minor variations in mobile web browsers (for instance, mobile users will need to swipe or interact with a scene in order to start its accompanying audio), mobile users on both Android and iOS platforms will enjoy the same, rich experience as desktop users. Mobile users with an accelerometer chip can also use a gyro mode where tilting the device pans around the image. Although the virtual tour consists of aural and visual media, hearing or sight-impaired users are welcome and encouraged to download the full transcript of the site walk for use with text-to-speech or other assistive software. Check this page soon for its arrival. Users with web images disabled by default in their browsers can use the following text link to access the Virtual Tour, although images must be enabled to view its content. Have an idea that would help make the tour available to more users? We welcome feedback and hope you'll email us at project [at] ummeljimal [dot] org. Interested in more interactives? Zoom around a photographic chronicle of Umm el-Jimal's history in the Timeline, view a wall of objects unearthed from the ancient site in the Artifact Exhibit, or discover great sites and travel ideas in the NE Jordan page's interactive map.